If you cannot join us in person, the offical texts of our novena are provided here for you to join us in spirit on Thursdays or at any other time you feel the need to invoke Our Lady. Let us praise our God in veneration of the Blessed Virgin Mary, our Mother and Protector. O Almighty and merciful God! You have given the Church a wondrous help and defense in the most holy Virgin Mary and You have honored Her sacred image as the Black Madonna with remarkable veneration of the faithful. Grant in Your mercy that, under Her protection, we may struggle confidently throughout our lives and at the moment of death be victorious over our enemy. We ask this through Christ our Lord. Amen. 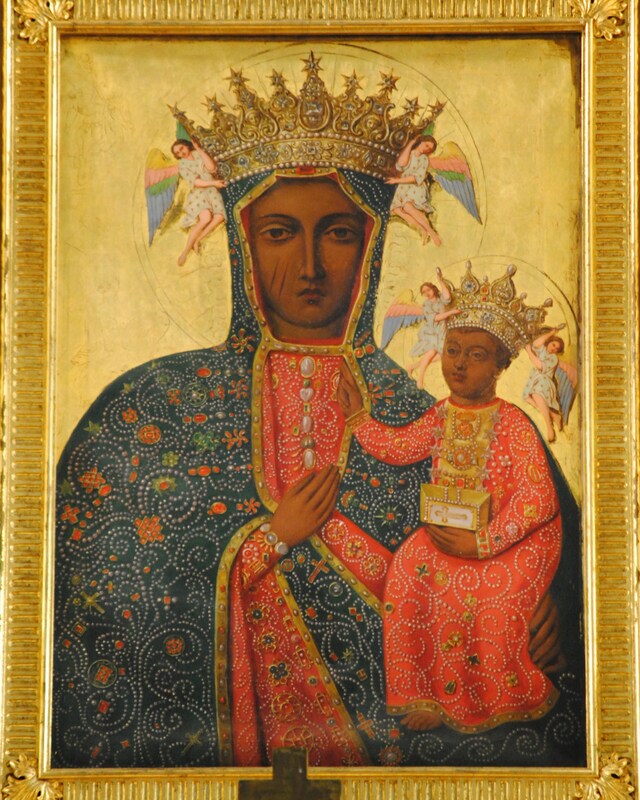 O Black Madonna, our Mother and Queen of our nation! Trusting in Your maternal goodness and powerful intercession with Your Son, we place before You our humble prayers and petitions. To You we commend all our needs, in particular (Mention requests silently in your hearts), our families, and all children of our nation. R: We thank you, O Black Madonna, our Mother. R: We ask You, Mother intercede for us. R: We ask You, Mother, intercede for us. R: Be our help and protection. R: We beseech You, O Black Madonna, our Mother. It is to You, O holy Mother of God, that we go for refuge and protection. Look kindly on us as we cry to You in our need. Glorious and blessed Virgin, be with us always and rescue us from every kind of danger. Amen. Mother of God, Immaculate Mary, to You I consecrate my body and soul all my prayers, works, joys and sufferings, all that I am and possess. With eager heart I dedicate myself to You in slavery of love. I give You complete freedom in making use of me for the salvation of men and the assistance of the Holy Church of which You are the Mother. From now on I wish to do everything with You, through You, and for You. I know that by my own strength I shall accomplish nothing. You, however, can do everything that is the will of Your Son, and You are always victorious. Grant then, Help of Christians, that my family, parish, and my country may truly be the Kingdom of Your Son and Yours. Amen. This is a very lovely website. I had lost the Black Madonna many years ago, its a miracle that I have found her again. For the first time of my life I knew you Our Lady of Black Madonna. Thank you so much to my Polish boyfriend who introduce you to me. Since i’ve knew you im looking for a novena prayer and finally i’ve found here.. I implore your prayers for the suffering, the despairing and the dying. For those in need of work and those in need of acceptance, just as they are. For humble hearts for both sinners and saints on this earth. And, Holy Mother, for God’s infinite mercy upon the Church, the nation, and the world. Mother of Mercy, pray for us now and at the hour of our death, Amen. Thank you Our Lady of Czestochowa for your mercy & intercession. I coming to see you this august. Please pray for our journey, with 41 of us lead by your servant Mgr. Nicholas Ong, and organize by D’Seven Travel & Tours. Please pray for the wisdom and courage to bring pilgrims and experience your prayer and intercession. Growing up in a Polish family, I always looked up to Our lady of Czestochowa. She was this great holy women and her image was in my head when saying the hail mary. Its funny how an image of Mary can have such a big impact on my life spiritualyand mentally. When i was growing up through troubling times…it was her face that would put me at ease. I knew that it was her and her son that were there when i was alone. She was and always will be the most respected woman in my eyes. i once or even twice that I went to the church of the Black Madonna in the States, which I forgot where it was at? I think it was in Pennsyvania. O Mother of the Black Madonna, please intercede for my wife for her continued recovery and me too of my physical and spiritual affliction.